Anyway, every day for the past week when I’ve logged in I’ve found Taka at this or that steampunk store or museum or whatever. And slowly Taka’s vision of a steampunk paradise has begun to take shape. 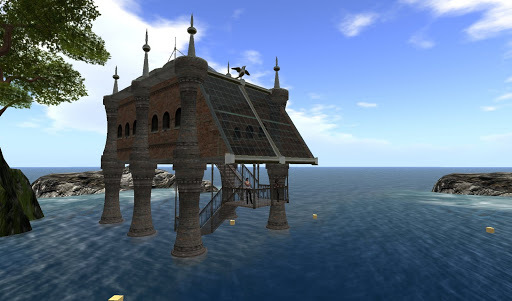 Here are a few photos of some of the features on the island. 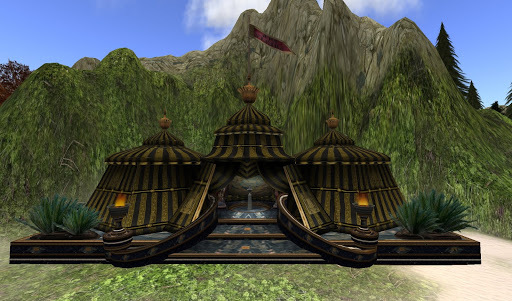 Yeah… I’m pretty sure this is gonna be the main feature on the island, this steampunk era sultans tent villa. Or maybe it will be this house sitting above the waters. Otoh, we are warming up to this Gypsy campsite. I have no idea where we are headed with this steampunk twist in our lives, however I have thrown myself into it with my usual reckless abandon.